It is only a matter of time before the cost of entry into VR gaming comes way down. Consider that we have already seen Oculus lower the system requirements for its Rift headset—though a less dubious way of spurring mass adoption is through product maturity, which will lead to less expensive headsets like the one Lenovo is currently showing off at the Consumer Electronics Show (CES) in Las Vegas. Many of the details surrounding Lenovo's headset are still under lock and key, and unfortunately the headset it brought to the convention is a non-working prototype. That buzz-killing disclaimer aside, what Lenovo is showing off is a headset that will cost less than $400 and weighs just 350g, which is 105g lighter than the Vive. There are pictures aplenty at The Verge and Engadget. Lenovo's headset also offers a higher resolution than either the Rift or Vive—it has two 1440x1440 OLED panels, though again, the prototype is a non-functioning model so there's no way of comparing them just yet. This is a room-scale VR solution, though it does not require any mounting hardware. Instead, there are a pair of cameras on the front that allow for mixed reality experiences and "inside out six degrees of freedom" sensors. It also lacks motion controllers, as Lenovo will lean on third-party solutions made built for Microsoft's previously-announced Windows Holographic platform. 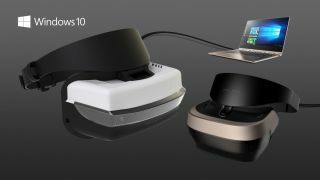 Lenovo is one of several OEMs working on VR headsets for Windows 10. HP, Dell, Asus, and Acer are also planning to release lower-cost headsets of their own starting at around $299. While pricing is subject to change, Lenovo said the prototype it is showing off will cost somewhere between $300 and $400, and probably closer to $300.